If you’ve never had the joy of attending a Cymande concert, this mix allows you some of the access, as live portions are interspersed with classic recordings. Cymande, with their unique blend of reggae rhythms and funk syncopation, have always had a message. 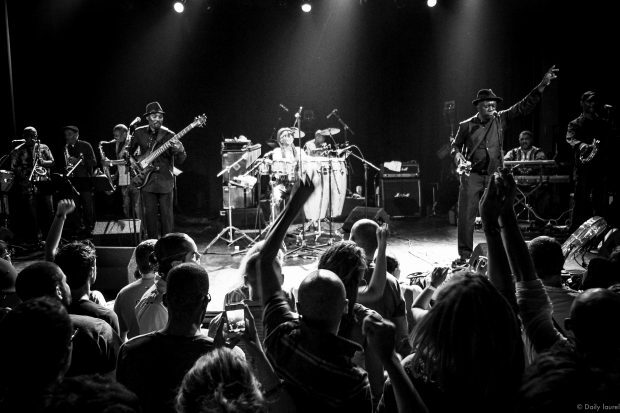 Cymande, with their unique blend of reggae rhythms and funk syncopation, have always had a message. Indeed, ‘The Message’ is one of their finest credits. It is of love, unity, Rastafarian ideals and, above all, respect and peace. The band even adopted the dove as their emblem. Highlighted by Patrick Patterson’s trademark guitar sound, a delicious, warm fusion of the Caribbean and African highlife, and stitched together by drum breaks and multiple percussion, their music encapsulated the black experience in 1970’s Britain. In introducing ‘Bra’, we learn that the name is actually a truncated version of the greeting, ‘Brother’. Cymande’s musical brothers have provided a strong platform for some of the today’s brothers, their hip-hop descendants, through the modern-day art of sampling, to continue spreading the message. Spiritual lineage indeed.